Chelsea forward Eden Hazard seemingly couldn’t resist a little dig at two of his old managers in Jose Mourinho and Antonio Conte after the club’s latest win in the Premier League. 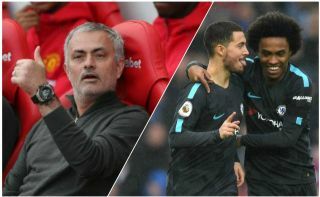 The Blues made it four wins out of four yesterday as they eventually overcame Bournemouth 2-0 at Stamford Bridge, with Hazard scoring the second late on. The Belgium international looks to be enjoying his football under new Chelsea manager Maurizio Sarri after a difficult campaign under Conte last term. CFC now look a more attacking outfit with a commitment to possession-based football, which certainly suits Hazard down to a tee. Speaking afterwards, the 27-year-old admitted he enjoyed the change of tactics, saying it was very different to life under both Conte and Mourinho – two managers who often seemed to fail to get the best out of him due to being slightly more defensive in their tactical approach. ‘I like to have the ball. Not in my own half, but in the last 30 metres,’ he told Chelsea TV, as quoted in the Daily Mirror. This is not the first time Hazard has dug out Conte over his tactics, with the former Lille star saying this after the defeat to Manchester City last season in which he played up front and barely touched the ball as the team lost 1-0 at the Etihad Stadium. ‘When the manager plays me up front, I try to give everything. We haven’t played a good game. For me personally it’s difficult to play a good game when you only touch the ball three times,’ he was quoted in the Guardian in March.